Hank Green started making YouTube videos in 2007 with his brother, John. They thought it was a pretty dumb idea, but it turned out pretty well. 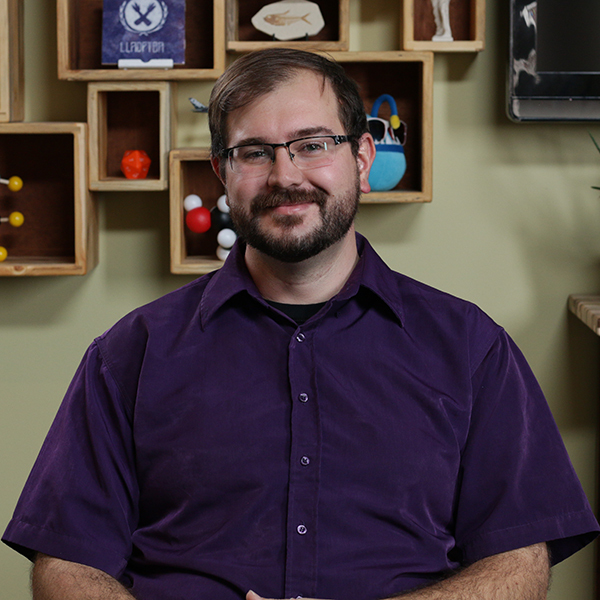 In addition to his work with SciShow, Hank is the co-founder of VidCon, DFTBA Records, and Crash Course. Blake is a science journalist who worked for National Geographic before coming on board to report, write and edit for SciShow and Crash Course. He’s also the creator of Western Digs, a science news site that covers archaeology and paleontology in the American West. Caitlin loves learning and making things. She produces all things SciShow, and hosts 1/3 of SciShow Space. One of her greatest accomplishments is receiving the "Most Likely to Say 'I Can Do That!'" Award from Hank and Michael. Stefan Chin has been making videos with SciShow since 2013. He loves motion graphics, spreadsheets, and gaming. He's also on a quest to find the best pad thai on the West Coast. Alyssa spends most of her time deciphering serious academic papers about asparagus. But after hours, odds are you'll find her losing spectacularly at a video game or surrounded by circuit boards and an assortment of screws. She knows an alarming number of obscure facts about tiny towns. Cartoonist/animator Sam Schultz spent his youth playing Nintendo and reading Krazy Kat comics instead of learning math, but that’s worked out pretty well for him so far. In his free time he can be found stressing out about his mobile art gallery and playing Dungeons & Dragons. Hiroka is a video editor, a filmmaker/lover, a traveller, and a soon to be aunt of three nephews. Her name means “shiny flower.” She knows it doesn’t make sense at all, but she likes it a lot. Ceri spends her time learning about things like arsenic clothing and giant laser arrays. She's worked on comics, pipetted lots of DNA, and had a one-day stint as a college mascot. Some of her favorite things are pine trees, cartoons, beagles, and green tea. Victoria has been a nerdfighter since 2007, and she can sense when anyone within a thirty-mile radius mentions Harry Potter. She graduated from SUNY New Paltz with a degree in creative writing and a minor in theatre, and she will still talk to anyone willing to listen about the Quidditch team she founded with a group of awesome nerds. Tuna is the kind of guy who reads all the manuals for the things he buys. Nerdy, maybe, but he never has to ask about camera settings. In his spare time he plays and records music and does sound design for film, but his time is rarely spare because he has a tendency to take on more projects than he should. Someday he'll hit a balance and be able to take a break, probably, but I wouldn't count on it. Bill is doing fine, thanks for asking. In his free time he likes to hang out with his wife, son, and two dogs, Yogurt and Aldo Leopold. When he has the time he enjoys tasting various ice cream flavors and acting very snobby about it. Jenova spends her time playing video games, reading, traveling, and perpetually writing a sci-fi novel that’s always coming out next year. Her cutest distractions are her puppy, Leia, and her husband when he sings her Top Gun songs. Sarah is a filmmaker/animator and occasional DJ who probably just watched a super-strange movie and would like to tell you all about it. She has entirely too many college degrees (or maybe just enough?) and a love for all things creepy-crawly. Alexis can usually be found creating things, dreaming over too-sweet coffee, or trying to decide which Elder Scrolls game has the best music. (She's still undecided.) She's also a sometimes-vlogger, Michigander, and retired college marching band geek. At five years old, Christie she told her teacher she liked to "open the mouths of dead geckos to look at their tongues"—an obsession with life that has only deepened with time. She studied toxic lionfish for her PhD and wrote a book on venomous animals, so she's most proud of the fact that she's made it into her 30s unscathed. Well, except for that urchin sting. And that monkey bite. But that was really not her fault, and hey, at least monkeys aren't venomous. Julie spends her time asking Hank and John what they want to do. She also just waters her plant and lurks around the office trying to make use of her Psychology degree. In her spare time, she enjoys running, hiking, random volunteering and other forms of Type II fun. Marie Ann loves all narratives, regardless of whether it is read, watched, listened, or played. She is surprisingly talented at corralling humans into small rooms for meetings. As a former Floridian, she is often confused by something called winter.